What are the most efficient thermostat levels for the summer? The summer is upon us! It’s time to hit the pool, the beach, the boat or relax under a nice shady tree with a great book. But sometimes the summer can also bring hot and muggy days. The days where it’s tough to breathe and walking to mailbox makes you feel like you just swam a few laps in the pool. It can also make sleeping at night almost impossible! Installing air conditioning and keeping your system properly maintained can help give you a cool and comfortable place to escape the heat. But, it can also drive up your energy bill and put a crunch on your wallet. It’s suggested that when you’re home, you should set your thermostat to 75-78 degrees. This is generally a comfortable temperature for most people if your humidity levels are controlled. If your humidity levels are too high, then 78 may feel too hot and muggy. But if you maintain the right humidity levels, then 75-78 should feel perfectly comfortable for most people (here is more detail on the right humidity level). If you’re leaving for an extended period of time for vacation or a long weekend, you may consider turning off the system completely and cracking a window to allow excess heat to escape. However, if you’re just leaving to go to work for a few hours, you’ll want to turn the thermostat to around 85. Studies show that for every degree above 78, you could save approximately 6-8% off your cooling costs. So, if you’re cooling off your home throughout the day when no one is there, you’re just wasting energy. However, you don’t want to allow it to get too hot in the house, even when you’re away. Letting your home get over 86-88 while away will cause the system to work hard to bring that temperature back down. Want to control cooling costs even more? Install a whole house dehumidifier. High humidity levels make the air feel much hotter than it is and can cause mold and mildew issues in the home. A dehumidifier works to remove moisture in the air and makes the air feel much cooler. If you feel hot even when the temperature is a comfortable 75, you may need to control those humidity levels. Here is more detail on whole house dehumidifiers. Have your unit serviced and tuned up. Make sure that you have your unit serviced by a licensed professional each year. This will not only keep your system running more efficiently, it will help extend the life of the system and better control costs. Learn more about HVAC tune-ups here. Simply opening windows on a cool night will allow cooler air into your home and reduce the need for your A/C unit to turn on. Take advantage of those cool nights and let a little fresh air in your home. If you sit next to a window on a bright and sunny day you’ll understand just how much heat can come into your home. By drawing the blinds on the sun-facing windows throughout your home during the day, you can keep the heat out and the cool air in. Using a fan can help recirculate the cool air throughout the home and make everyone much more comfortable without having to lower the temperature. Smart thermostats will learn about your heating and cooling preferences. They know when people are home, and when they aren’t. 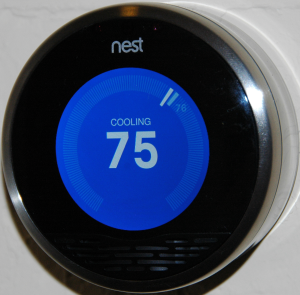 Studies show that installing a smart thermostat can cut cooling costs by 15%! Learn more about smart thermostats here. At TJ’s our team of HVAC professionals will make sure you have the right systems in place, running at peak efficiency. Contact us today for a free consultation.